Last year, we drew a simple distinction in Token Mania: Securities and Utility Tokens. One involved the capital structure, and the other involved mutualizing assets of a company. Well, the world ended up being far more complex in terms of what software tokens are able to do and represent. 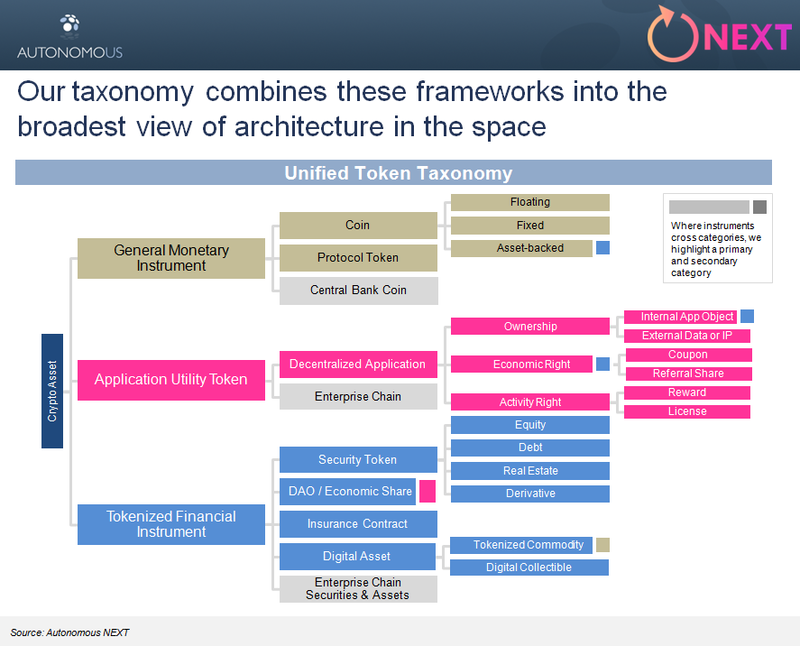 Several projects in the space have been building a Taxonomy (i.e., a categorization scheme) to make sense of these activities -- with great work from The Brooklyn Project, Brave New Coin, Untitled Inc., OnChainFx, 20|30 and others. And like these projects, we now contribute into the Creative Commons an attempt at unifying and clarifying an Autonomous Taxonomy. The reason that this work is important is because good data architecture drives many downstream decisions, and also has meaningful regulatory implications. Our top level categories are (1) General Monetary Instrument, (2) Application Utility Token, and (3) Tokenized Financial Instrument. Monetary instruments are the payment unit of crypto economic activity, with coins like BTC attempting to be used everywhere for all use-cases, and protocol tokens like ETH attempting to be used generally within its protocol. Also included in this category is the concept of Central Bank-back crypto currency. Next, we we split out Utility tokens into public (e.g., Filecoin) and private chains (e.g., UBS settlement coin). 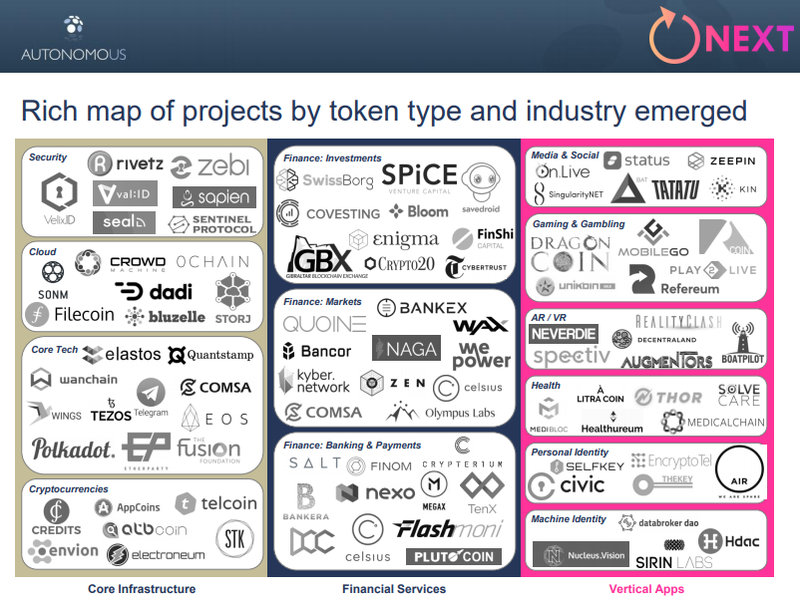 Within public, we use the thinking of the Brooklyn project, which relies on token features: ownership of internal and external objects (e.g., Identity, Cryptokitties), economic participation (e.g., Binance coupons), and the ability to perform activities, like doing work for rewards or purchasing a license to use a software. The last category of Financial Instrument primarily refers to the coming wave of (1) security tokens, which are akin to equity or real estate crowdfunding sitting on more modern, decentralized infrastructure. These assets have an established and clear role relative to capital tables of corporate entities. We expect a convergence of enterprise and public blockchains as consortia digitize existing capital markets and become interested in crypto liquidity. Also included are (2) DAOs as economic entities, (3) Insurance/Risk contracts, (4) and Digital Assets, either native or tokenized. There are a few interesting edge cases that we discuss in the full paper -- what is the practical difference between a cryptocurrency "backed" by a gold asset, and a gold asset that has been tokenized into ownership shares. Or, when does a native digital asset like a Crypto Kitty start looking like an equity interest in a Picasso? Anything we missed?